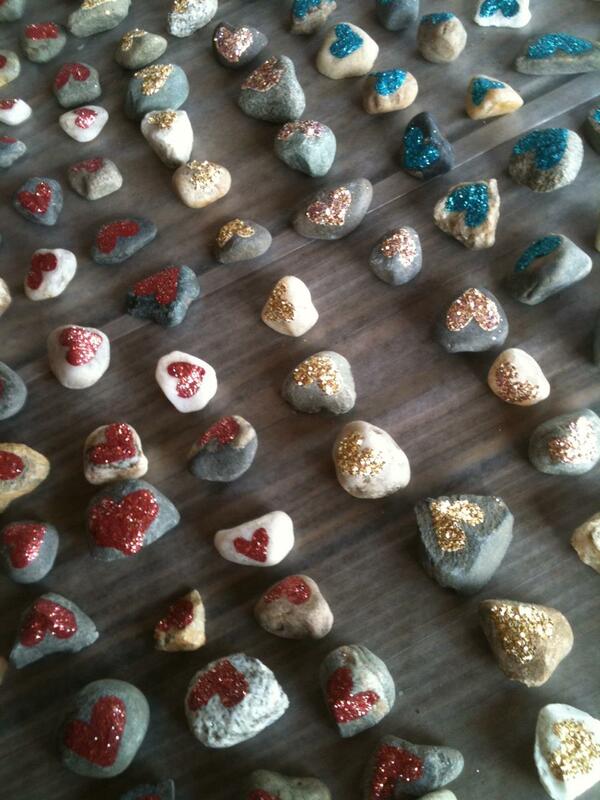 In early July, I spent hours and hours painting 170 glittery hearts on small rocks I pick up while walking on Vermont’s dirt roads. I normally give heart stones to people who come to the Happiness Paradigm Store and Experience as a tangible reminder of how important generosity is to happiness. This batch of stones was specifically painted to hand out to spectators at Montpelier‘s Fourth of July parade. A group of friends and family joined me in a Happiness Paradigm contingent, including my husband Bob playing happy songs on the ukulele with a miscellaneous group of back-up singers. Two children — 3 year-old Edwin and 5 year-old Avery — were the primary stone givers. 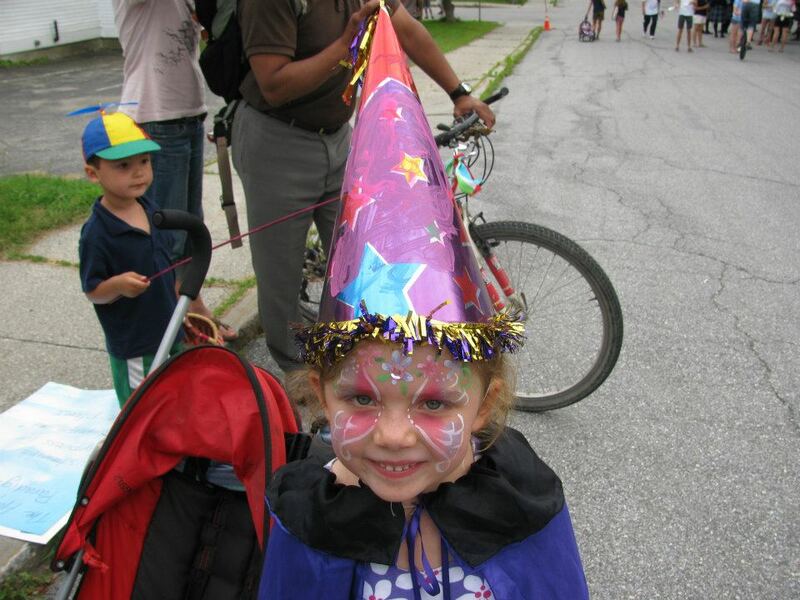 Edwin was low key in his baseball cap, but Avery was sporting an amazing face painting, a cape, a wizard hat, and bells strapped to her shoes so she made music when she ran — which she did, quite earnestly, to put the stones in welcoming hands. Anyone fortunate enough to get a stone from either child had to have experienced a surge of happiness. Edwin and Avery, getting ready for the parade to start. It was a delightful and lighthearted experience — and, very, very serious. Working in the happiness field has a multitude of rewards, but what truly motivates me is my concern for the environment — more precisely, climate change. I am a strong believer in the urgent to need to shift our personal and societal definitions of success toward genuine well being and away from money and material goods. The latter not only fails to take happiness into consideration but also feeds our runaway consumerism. This, among other evils, trashes the environment to such an extent that our very survival as a species is in peril. Whereas, following the happiness path is a map toward a compassionate and sustainable future. You may think this is hyperbole, but I don’t mean it as such. Many brilliant, sober, knowledgeable individuals have connected the dots between our obsession with a growth economy and the destruction of the earth, our home. For just one quick example, check out Annie Leonard and “The Story of Stuff.” It is no accident that everything for sale at The Happiness Paradigm is re-cycled or re-purposed. But back to the parade … our weather that evening was heavenly, an absolutely perfect summer blessing. The same could not be said for Washington, D.C. where we lived for several decades before moving to Vermont. The weather there was dreadful. The unprecedented derecho that clobbered D.C. residents — along with millions of others from Chicago through West Virginia and out to the Atlantic Ocean — was enormously destructive. At least 22 people died, and nearly 4 million customers were without electricity for nearly a week — a period of “unrelenting, stifling heat,” according to an AccuWeather.com report. That means, many millions of folks were truly suffering. I knew heat when I lived in D.C. One summer weekend, when our kids were away at summer camp in Vermont, the temperature crept into the low 100’s. My husband and I got cold salads from the grocery store and camped out in our bedroom, where we had a window air conditioning unit. It was just too hot to be anywhere else in the house. We did go to a movie that night, and I remember standing in line outside the theater in the early evening when it was still hot and humid enough for sweat to roll down my back. One weekend of that in the 1980’s was kinda fun. It’s not fun anymore — especially when you factor in the fires, floods, tornadoes, and a drought being compared to the dust bowl, all in our country in the last year. Scary. And scarier: read Bill McKibben’s new article in Rolling Stone magazine: “Global Warming’s Terrifying Math.” McKibben, who strikes me as more of a straight-shooter than a fear monger, says he is almost without hope that future humans will be able to survive on this planet. It just doesn’t get any bleaker. Fortunately for me, I’ve also been reading Barbara Frederickson’s seminal book, Positivity. Frederickson’s words are helping me keep my own spirits buoyed, which is absolutely a good thing. Her years of research have proven that negativity shrinks our ability to see options. Positivity demonstrably leads to greater resilience and increased creativity in problem solving. Frederickson calls this broadening, and I saw this principle at work yesterday after a session of laughter yoga at the Happiness Paradigm. We were discussing why happiness matters in light of climate change, and one participant observed that when we’re happier, we have much broader vision and greater appreciation for the beauty of the natural world around us. Thus, we will be much more motivated to take better care of the environment. Another giant in the positive psychology field, Martin Seligman, stresses that working from strengths makes us individually happier — and his website has a free test anyone can take to learn more about what our personal strengths are. It also seems extraordinarily practical to know how to make our best contributions to tackle the challenges ahead. The “same thinking” has been the growth economy. We need a new paradigm to solve the problems. A happiness paradigm. ASAP. Beautifully written, and so thoughtful. Thank you! I really agree that changing the way we think inside ourselves and beginning to experience our outer world with creativity, joy and compassion, will help us all take off the blinders and find the many possibilities for evolved survival on this beautiful planet. Yes! I have been noticing that when I am happy, I can deal with problems much better. But if I am down, they usually do not get any attention, and pile up. I’ve worked hard to become more positive. Thanks for your help, Ginny. Paula and Martha, thank you both for your feedback. Martha, you are more than welcome for any help I provide! I’m so grateful for the opportunity to do this work! Nice Ginny! Laughter yoga works really well on long road trips too. Judy, I think laughter yoga is another one of those activities that people can scoff at. And that’s unfortunate, because it provides a great boost of energy and positivity. Plus, when you do it in community, it helps build relationships — though maybe you can’t do that on the road! Do you do laughter yoga by yourself on road trips? Not as fun by oneself, but can, at least, release tension in jaw and face. What a poignant post, Ginny! I’m so glad you’re drawn to this work – putting yourself out there as an example is the best way to get the rest of us to see the light! The ability to clearly see (and accept) the dangers we face as a society AND feel hopeful about our ability to navigate the future with love and compassion can feel tenuous at times – what a delicate balance! You model it perfectly. Roni, thank you — your support is so very helpful. We’re all in this together!